"Without effort, there is no gain"
We were told that she was coming a few weeks before the event on her Diamond Jubilee tour around the country and that she was going to visit Ilford, which is where I live. We were asked to create a piece to commemorate the tenure of her reign. We weren’t happy. In the middle of our exam, already slightly behind and stressed, creating a piece for this exhibition was not at the top of our priority list. And we were convinced that she was not coming. Nevertheless we trudged on for three weeks in most of our free periods making this huge piece. 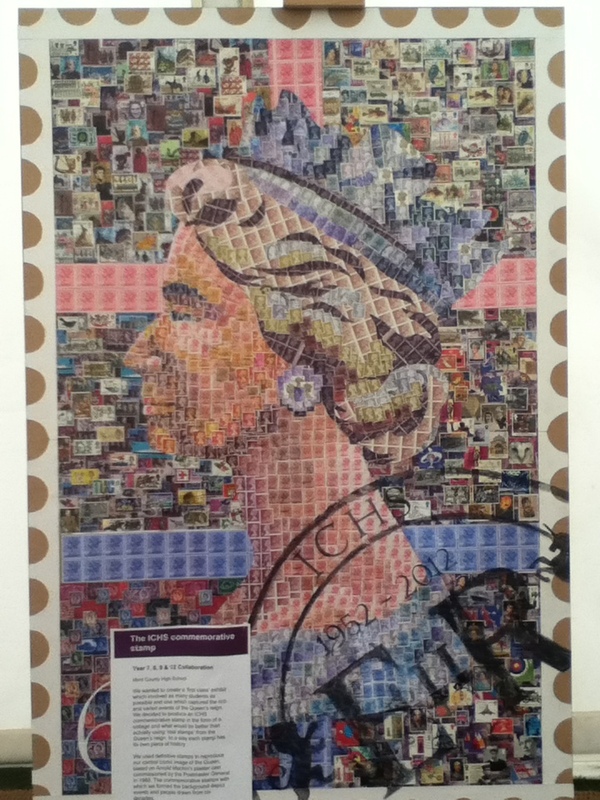 It was a 1.5 metre tall stamp of the queen made up of little stamps and it was a horror to create. First we sourced stamps from the last 60 years, and then we mapped out where they were going to go. Then we had to stick them. One by one. Every stamp. I can truly say that I never want to see or stick another stamp down in my life. Dammit! I can see one directly below this…wait. There is over a thousand down there. That is a close up of what we created. It looks great there and we were really happy with it. Then I got the call. I really wasn’t expecting it, considering we were told unequivocally from the beginning that we were never going to meet her, regardless of how good the work was. I guess we were all wrong. My teacher told me that I was chosen to meet her and present the work to her – I must admit it was a bit of a surprise, but a nice one at that! I received an official invitation in the post a few days later, calligraphy and all and it sunk in…I was going to meet the Queen. The document contained lots of detailed instructions on etiquette and all that rubbish about how to address her and talking to her and making eye contact (not joking!) so it became real for the first time. And at the risk of boring you with the rest of the back story, I suppose I better get into the main bit.